Hummingbirds are fascinating creatures, but sometimes they aren’t too smart. While they have the ability to quickly dart in any direction, they have a natural tendency to fly straight up when they’re frightened or anxious. They don’t understand the concept of roofs, and can quickly wear themselves out when they become trapped in a garage. Here’s how to get a hummingbird out of your garage quickly. 1.2 Well, that didn’t work. What else can I try? It will only take about an hour for the trapped bird to exhaust himself and starve to death. Since your brain is more evolved than a hummingbird’s, it’s up to you to help the tiny fella find his way out. Keep your kids, pets, and other curious beings away from the open garage door. Having an audience will just make the little hummer more upset and anxious. The first method to try is to hang your hummingbird feeder near the open door of the garage and hope he flies over to it to feed. If you don’t have a hummingbird feeder, chances are the neighbors do, or he may have been attracted by flowers in the area. You could ask the neighbors if you can borrow their feeder after explaining the situation. Otherwise, try to locate the flowers that attracted him; they will most likely be red or orange in color and trumpet-shaped or tubular. Pluck a few blossoms, fasten them to the bottom edge of the open garage door, and see if the hummingbird takes the bait. From there he may fly on outdoors, or he may fly back into the garage. Well, that didn’t work. What else can I try? Let’s assume the hummingbird feeder trick didn’t work within a few minutes, or he decided to fly into the garage ceiling again. The silly little bird is putting himself in jeopardy, and you’ll have to take drastic action. 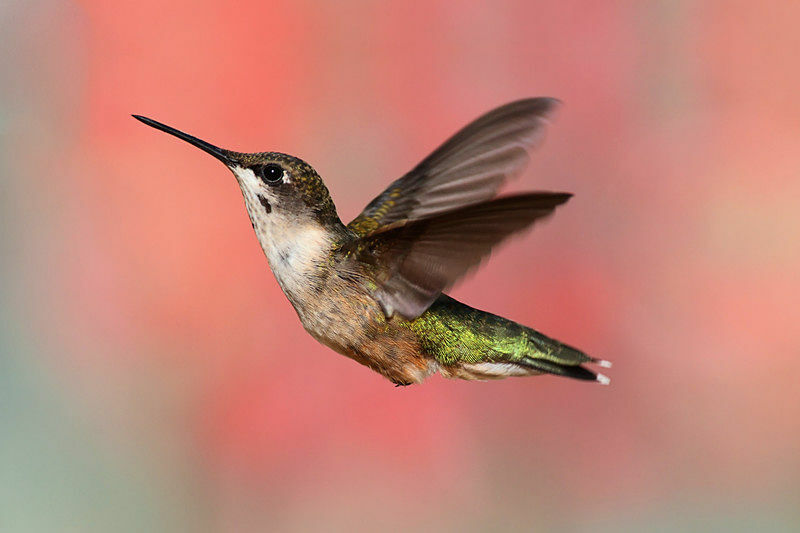 Take advantage of the hummingbird’s natural aversion to flying in the dark. Close the overhead door and turn on the lights. Have your flashlight handy. When the bird is over an area of open floor, turn the garage lights out. The hummingbird should land on the floor when the garage is darkened, at which point you locate him with your flashlight, gently scoop him up, and set him free outdoors. Have someone open the door for you if possible, so you can gently cup the little bird in both hands. If there are windows in your garage and you can’t darken it, hang a hummingbird feeder near the ceiling so the hummer has a place to rest and eat. Leave the garage door open, and hope that the hummingbird will calm down enough to find his way out on his own. If not, use the flashlight technique near dusk, when bright light isn’t coming through the windows. The hummingbird may not fly away immediately after you’ve caught him, but rest in your hands instead. Just give him a minute to catch his breath, or offer him a drink from the hummingbird feeder (outdoors). Handle him carefully until he decides he’s rested enough to fly away. Hummingbirds don’t usually carry parasites, but wash your hands afterward, just to be on the safe side. Hummingbirds are attracted by bright red and orange colors, and most overhead garage doors have red emergency release handles. When the hummingbird sees the red handle its instinct is to fly toward it, and the wee bird may end up trapped in your garage. Hummingbirds may also be attracted to colorful can labels, kids’ outdoor toys and bikes, or other brightly colored distractions you have stored in your garage. Keep your garage door closed whenever you can, especially if you plant flowers or hang hummingbird feeders that attract them to your yard. Paint your garage door’s emergency release handle a dark color or tuck it out of sight when the door is open. Keep any bright red or orange objects stored in a closed cabinet or covered up so they’re out of sight. Hummingbirds are amazing little creatures, but their natural instincts can sometimes get them into trouble. This makes it important to know how to get a hummingbird out of your garage. Once you’ve lured the little bird out of your garage, try to figure out what might have attracted it there in the first place. Eliminating or hiding brightly colored objects that may have lured it into your garage will help keep it safe and humming along. Hey Buddy!, I found this information for you: "How to get a hummingbird out of your garage". Here is the website link: http://backyardbirdingblog.com/how-to-get-a-hummingbird-out-of-your-garage/. Thank you.